10in x 12in .025 metal with four 1/8in mounting holes and 1/4in rounded corners. The Baltimore & Ohio Railroad was chartered in 1827 as the first railroad in the U.S. and was the first railroad to offer passenger and freight service to the public on a scheduled basis. 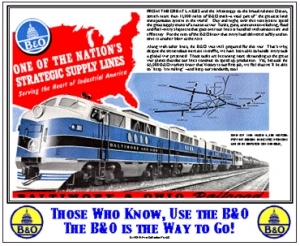 C&O took control of the B&O in 1962, then in 1987 when the B&O was the Nations oldest railroad at 160 years old, was legally merged into the C&O RR and is now both are part of the vast CSX Transportation network. Click on above image for zoom.